Results of the 2013 Deer Hunter Survey conducted by the S.C. Department of Natural Resources indicate that the statewide harvest of deer last season totaled 225,806, an increase of 4 percent from last year. An estimated 124,482 bucks and 101,324 does made up this total, according to Charles Ruth, Deer and Wild Turkey Program coordinator for the S.C. Department of Natural Resources (DNR). Since 1997, DNR’s Wildlife Section has employed an annual random mail survey to estimate the harvest of deer at the state and county level. This year’s survey was sent to 25,000 hunters. 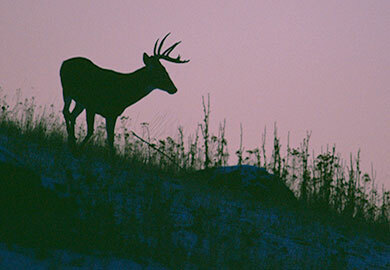 Prior to 1997 deer harvest figures were dependent on Deer Check Station reports in the 18-county Upstate and reports from hunt clubs in the 28-county Coastal Plain. “The old way of documenting the deer harvest had flaws including failure to report harvested deer and the fact that there was no reporting required in many cases. Based on the survey work that has been done since 1997, it appears that the old system was documenting only about half of the deer being harvested annually in South Carolina, which is exactly why DNR is now using the survey technique," said Ruth. Increasing rapidly through the 1970s and 1980s, the deer population in South Carolina has generally been declining over the last 10 years, according to Ruth. Although the harvest was up a bit in 2013, it was still down about 29 percent from the record harvest established in 2002. The reduction in harvest seen since 2002 can likely be attributed to a number of factors including habitat change. Although timber management activities stimulated the growth in South Carolina’s deer population in the 1980s, considerable acreage is currently in even-aged pine stands that are greater than 10 years old, a situation that does not support deer densities at the same level as younger stands in which food and cover is more available. Wildlife population densities are directly tied to the habitat and since habitats are always changing, population densities are also always changing. Also, coyotes are a recent addition to the landscape and are another piece of the puzzle. DNR has recently completed a major study with researchers at the Savannah River Site investigating the affects coyotes are having on the survival of deer fawns. Cumulative data through the first 3 years of the study indicated approximately 70 percent total fawn mortality with coyotes being responsible for approximately 80 percent of these mortalities. If these findings even moderately represent a statewide situation, this “new mortality factor” is clearly involved in the reduction in deer numbers. This is especially true when combined with extremely liberal deer harvests that have been the norm in South Carolina. The last 3 years of the study were for the purpose of determining if reducing coyote density through trapping increases fawn survival. It seems logical that if coyotes are preying on fawns, then significantly reducing coyote densities should increase fawn survival, said Ruth. Over the course of the 3 year coyote “control” phase, 474 coyotes were trapped/killed on the study areas. Overall, results showed only modest increases in fawn survival following these efforts with an overall average of about 39 percent increase in survival. Also, trapping seemed to help in some years but have little effect on predation in others. This “year” effect may have something to do with the availability of coyote food sources that may change in abundance annually. Given these results and the difficulty and high cost of coyote control, it seems apparent that making adjustments to how we manage deer, particularly female deer, is more important now that prior to the colonization of the state by coyotes. Top counties for harvest in 2013 included Bamberg, Union, Allendale, Spartanburg, and Calhoun with each of these counties exhibiting harvest rates in excess of 16 deer per square mile, which should be considered extraordinary. Very few areas in the United States consistently yield comparable harvest figures. All areas of South Carolina have long and liberal firearms seasons and the majority of deer (180,193) were taken with centerfire rifles in 2013. Shotguns (21,452 deer) and archery equipment (14,452 deer) also contributed significantly to the overall deer harvest, whereas muzzleloaders, crossbows and handguns combined (9,709 deer) produced less than 5 percent of the total statewide harvest. Although the annual Deer Hunter Survey focuses on deer hunting activities, there are questions on the survey related to the harvest of wild hogs and coyotes in the State. Results of this year’s survey indicate that approximately 30,076 coyotes were taken incidental to deer hunting, up 6 percent from 2012. On the other hand, approximately 35,281 wild hogs were killed statewide representing a 24 percent increase from 2012. Other survey statistics indicate that approximately 131,963 South Carolina residents and 15,310 nonresidents deer hunted in the state in 2013. Deer hunters reported an overall success rate of 70 percent, which is outstanding. Resident hunters averaged about 16 days of deer hunting, nonresidents about 14 days, and the total effort expended deer hunting in 2013 was estimated at 2,340,484 days. “The number of days devoted to deer hunting in South Carolina is very significant and points not only to the availability and popularity of deer as a game species, but to the obvious economic benefits related to this important natural resource,” Ruth said. About $200 million in direct retail sales is related to deer hunting in South Carolina annually.